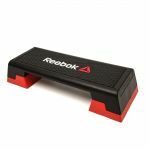 Adjustable to 3 different heights; 15cm, 20cm and 25cm, Compact and stackable design, Dimensions: 102 (L) x 38.5 (W) x 25 (H) cm, Non-slip sweat-resistant workout surface, Quick and easy to clean, Rubber feet prevent slipping and absorb impact, Simple click and lock feet adjustment, Solid build quality, The original piece of group fitness equipment, imitated the world over. 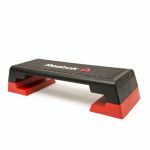 Suitable for all abilities and fitness levels, the modern red and black Reebok Step can be combined with mat work exercises, or used with hand, wrist or ankle weights for an even higher calorie burn. Popular in gym class settings, the step is often incorporated into choreographed routines to upbeat music Sturdy and durable for every lunge and jump, the Reebok Step's non-slip rubber surface means the user can focus on their form and positioning, plus it can be height adjusted from 15cm (5.9") to 25cm (9.8") in three increments for added intensity.